People were spoiled in the 70s. Imagine that: everything had happened in those two decades. 1958 was a world away from 1979: a whole history of pop music, for instance had been time-lapse condensed into the amphetamine acceleration of the intervening years. 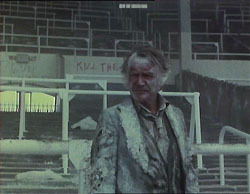 Quatermass, always an ambivalent figure in relation to modernism and to Progress - like Freud, he was their embodiment, and in being their embodiment also their greatest critic; it's easy to see how Quatermass could have seemed dustily, fustily outmoded, a fading monochrome relic, in brave new 1979. Postmodern temporality had not yet taken hold. We didn't know, then, that everything would come back, eventually. Kneale had been written the serial in the early 70s but the BBC's faintheartedness about cost meant that it was eventually taken up by Thames TV's film-making unit, Euston films. Instead of a budget of £250,000 for the whole series, the production was now able to command £300, 000 for each of its four episodes. Kneale apparently saw the serial as a requiem for the Sixties: a dark parable about the thanatropic drives which youth messianism could nurture. In place of the hippie dream of a renewed Earth, his trance-intoxicated postpunk protocrusties - the Planet People - long for an escape into another world, another solar system. Quatermass' landscape was projected directly out of seventies' anxieties. The choking ecosphere, the fuel shortages, the power-cuts, the disintegration of the social contract into a Hobbesian war of all-against-all, it was Sixties' utopianism in ruins. Those barricaded streets, the roving armed streetgangs (inspired by Baader Meinhoff and the Red and Angry Brigades) could equally well have walked off a Killing Joke record cover or from a Conservative party election broadcast. Such was the way in which imaginaries and impulses - reactionary, neo-archaic, radical - became collapsed into one another (collapsed like the abandoned vehicles from which the geriatric colony in the serial construct their bolthole rhizome) in 1979. 1979, I hardly need to remind you, was the year of Mrs Thatcher's election. And of Gary Numan's Replicas and Joy Division's Unknown Pleasures. If you want to think sf analogues for the 79 Quatermass, look to these artifacts rather than to the epic progfests (Star Wars and Close Encounters) to which it was inevitably, and unfavourably, compared at the time. Star Wars isn't even sf, it’s epic Fantasy; whereas Close Encounters, in those early, obsessive scenes, is almost Knealeian, actually - but all of that is dry-ice dissipated in the Jarre-like liteshow and cutesy big not bug-eyed 'aliens’ of the denouement. The legacy of these big two was catastrophic, perhaps fatal, for bigscreen sf. It’s not only the retreat from the social into Fantasy zones, or the reduction of ethical complexity into simple-minded Manicheanism, it’s the compulsory Spectacle of the conspicuously expensive FX . What Close Encounters has in common with Quatermass is its vision of human populations, entranced into unconscious complicity with the alien powers. But Quatermass is consummately able to resist the temptation to which Spielberg must succumb; that of anthropomorphizing the aliens (cf AI). The purposes of the aliens in Quatermass remain sublimely, unfathomably opaque, like their physical forms. Anything we ‘learn’ about them is conjecture, inference, speculation. They are light years away from us. In every sense. Kneale’s great themes – the intimacy of the alien; the lust for annihilation in organic beings –this time emerge in an analysis of Youth millenarianism. His rendition of youth culture is, predictably, more Nuttall-Bomb Culture, more Civlization and its Discontents, than it is Age-of-Aquarius utopian. The urge to herd together into crowds, the, is interpreted symptomatically as the following of a programme seeded deep into the unconscious of the young. Kneale’s usual cybergothic methodology – disinterring Now in the relics of the Deep Past – focuses on Neolithic stone circles. Quatermass hypothesizes that the megalithic sites are trauma records, the stones arranged as commemorations of mass exterminations. The Earth’s scar tissue. (The parallel between astropocalyptic events and stone circles had actually been made three years earlier, in ITV’s memorably creepy children’s programme from1976, Children of the Stones.) The stone circles were the sites of what Quatermass ominously refers to as previous ‘harvestings’ of the human race. Who can guess what the species reaping humanity is like and what their motivations are? A protein lust? Quatermass can only guess. Kneale was disappointed with the casting of John Mills, which was forced on him by Euston who insisted on a big-name star. Kneale preferred Andre Morell and Andrew Keir (who played the scientist in, respectively, the TV and the film versions of Quatermass and the Pit). He supposedly found Mills insufficiently heroic, scarcely recognizable as the same figure Morell and Keir had portrayed. Yet Mills’ quiet anger, his compassion and disgust for humanity, his slighted but enduring dignity, make him what could be the definitive Quatermass. Intertextual link: The Fall stole the Planet People's chant ('Lay! Lay! Lay!') on their 'Lay of the Land' (off The Wonderful and Frightening World of...). Er, [/I] needed there, Mark. I've been trying to figure out where lay of the land's "leys" come from for a long time and you've nailed it for me. Thanks Mark. One of the greatest basslines in rock too. I don't think you're being nostalgic Mark, but it would be interesting if you followed through on your analysis: i.e. compare this best-of 70s British TV with (what you think is) the best of current TV. I wouldn't know where to start -- I only like Hustle, TimeTeam, Buffy and Newsnight! Yeh, sorted it, I think. It's a real pain that these things don't show up on my machine (which reads [/] as a closing tag). Paul, yeh, wasn't sure whether to render it 'ley' or 'lay' . As for comparison between then and now --- where would you start? Visionary SF is a desolated zone: absolutely nothing to compare with Quatermass. One thing I forgot to note in the post was that it was possible to see both the first episode of Quatermass and Adventure Two of Sapphire Steel (popularly regarded as the series' chilling peak) in the same week. On ITV. the real significance of 79 is that it was the year i was born. a strange red glow covered the nightsky and a load of teenage girls reported seeing strange visions of peacock butterflys and herons as big as aeroplanes. FACT. 'barking Irish-born American drunk Brian Donlevy'. I find this description slightly discomfiting. Why specify in this odd way? Because although Donlevy sounded American - which was one of the reasons Kneale objected to his being cast - he was actually born in Ireland.